Zambia lies in the tropical belt of Southern and Central Africa. It is famous for its safari concept, unique in that you are not confined to a closed vehicle. 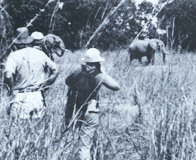 Game viewing is on foot, or in an open vehicle accompanied by a game expert and an armed game ranger (rarely needed, but a necessary precaution). You will learn to track animals by their spoor, distinguish between a kudu and a puku, and to capture it all on film! Day 1 — A short flight from Lusaka takes you to Mfuwe airstrip in the Luangwa Valley - and suddenly you know you are in the real Africa. You are now in one of the finest game reserves in the world. The drive to your permanent camp will give you a taste of the incredible diversity and abundance of wildlife available. Here among countless species of animals, the ‘Big 5’ make their home. The grass is yellow, coarse, cropped short by the constant grazing of buffalo. The trees are shorn of their bark and stunted by the pressures of browsing elephants - they are everywhere; it is impossible not to see them. The air is alive with bird cries, a bird-watcher’s dream. Day 2-5 — A pre-sunrise cup of coffee and then board open vehicles for a game-viewing drive. Your well-informed guide will provide you contact with the abundant game. This is home to great concentrations of elephant, hippo, cape buffalo and many varieties of antelope, including the Greater Kudu. The Luangwa Valley is the exclusive preserve of the of the Thornicroft giraffe. Lion and rhino are common and frequently seen. Return to camp for breakfast and rest. After lunch and tea, another drive through the woodlands and savannahs of Luangwa until sundown. Another option available is a night gamedrive, where you will be able to view animals that are active at night, an exciting opportunity. In the evening you can sit around the campfires and discuss the wildlife of the Valley with the local experts. Day 6 — Today you bid farewell to the Valley and head off for new adventure. this exciting form of game viewing. HOW FAR DO YOU WALK IN A DAY? The Trail Leader suits the distance to his walkers and their needs. Usually the group sets out at dawn and walks for 1.5 hours before having a break for tea, followed by a further 1.5 hours back to camp. This would be approximately 6 miles. In the afternoon a further 4 miles. Walks are not forced marches! If you prefer to stay in camp, this is quite acceptable. DO YOU SLEEP ON THE GROUND? No. There are thatched huts in each camp, with steel beds, mattresses, linen and mosquito nets. Lighting is by paraffin lamps. SO WE CARRY OUR LUGGAGE OURSELVES? No. Your heavy luggage is taken to your camp in advance by vehicle or porter. WILL I GET BETTER PICTURES WALKING THAN FROM A VEHICLE? No. On foot you will have to stalk animals to get close. You can get much closer in a vehicle. However, some shots you get on walks could never be obtained from a vehicle. AREN’T WALKING SAFARIS DANGEROUS? Of course there is some element of danger; this is what makes them special. Walks have been done for many years, pioneered by Norman Carr. Your guides are good at avoiding dangerous situations. WHAT IS THE AGE LIMIT? The minimum age is 12 years old. WHAT SHOULD ONE WEAR? Footwear should be light and comfortable, with good grip soles. Running shoes are ideal. Clothing should be neutral, never white; cotton is good. In the early mornings and evenings a jacket, trousers to protect legs and ankles from insects, and a hat are advisable. CAN WE INFLUENCE THE NATURE OF OUR WALK? Certainly. Your Trail Leader will design the walk around your interests. If you want to spend more time sitting and watching, and that is the consensus of the group, that is the way it will be. Walks are flexible. NOTE: Not to be missed are Kafue National Park and the Lower Zambezi National Park. Please ask for itineraries incorporating these two Parks into your itinerary.